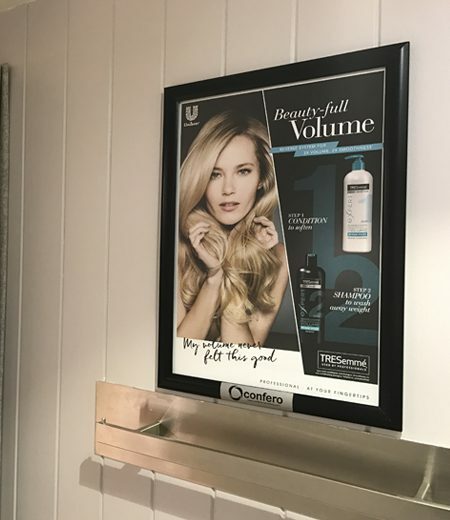 Confero have installed over 12,000 A3 format advertising panels in the individual fitting rooms of successful and established UK fashion retailers – Oasis, Warehouse, Dorothy Perkins, Miss Selfridge, Wallis, Evans, Outfit, Topman and Burton. Our retailer portfolio offers finite targeting of audiences aged between 15 – 55+. Networks can be bought exclusively, individually or Multi-Network for extended campaign reach. Fitting room posters offer advertiser exclusivity – no other third party brand will be present in the stores booked to your campaign. Proposal costs quoted for all Confero campaigns are inclusive of media agency and specialist commissions and production.